GOOD Magazine has a nice visual demonstration of a livable street, basically a city street designed to welcome pedestrians, cyclists, transit riders, and cars equally. Simple changes like curb extensions, textured crosswalks, bollards, and plantings turn car-choked urbanity into an inviting place to walk around. From the example, it looks like the Livable Streets Initiative would be a good first step for cities to take toward the carfree ideal. The changes they propose are inexpensive, leave room for lots of small iterations, and can be carried out by local groups almost as easily as local governments. Streets can and must be more than just a place for the movement and storage of private motor vehicles. The urban street of the 21st century will be a “complete street,” accommodating pedestrians, cyclists, and transit riders alike. 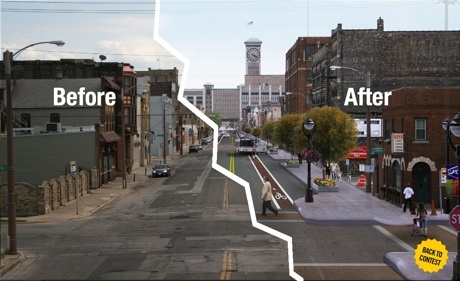 At the Livable Streets Initiative we are helping citizens re-envision streets as great public spaces. Individually, the changes are almost trivial. A corner expanded here, some cobbles laid down there, a few trees planted. 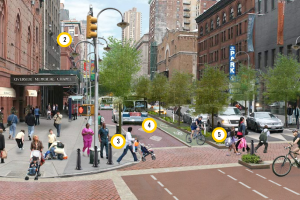 Only one major change would be necessary: narrowing the street to one lane in each direction. The overall effect is amazing, though; a crumbling undifferentiated gray surface becomes a cheery, purposeful street. I can easily imagine businesses, shops, and city-dwellers feeling drawn to this place after the change.